In PDQ Deploy, a deployment is the process of deploying one or more packages to one or more target computers. Use the Deploy Once window to select packages, select target computers, select credentials, and set additional deployment properties for immediate deployment. 1. (Optional) On the tree, expand the Packages folder, then select a package. 2.On the Package page, click Deploy > Deploy Once (or press Ctrl+D), or click Deploy Once on the toolbar. 3.If there are no packages currently listed under Packages, (or you wish to add more packages) click Choose Packages to navigate to the package to be deployed. 4. (Optional) If there are packages you do not wish to deploy, click the trashcan icon next to the package name. The Deploy Once window has two primary components—the Targets Editor and Deployment properties. The following table describes the two tabs of the deployment properties. The name of the package(s) being deployed. Select package(s) to be added to be deployed. Selects the target computers for deployment. Type a computer name or click Choose Targets to select computer names from target lists or external sources such as Active Directory, PDQ Inventory, Spiceworks, Target Lists, and Text Files. For more information about targets, see Creating a Target List, Part 2: Choose Targets. NOTE: You can also paste a target computer name (or list of names) directly into the Targets Editor section. If copying a list of names, ensure that there is only one target computer name per line. Allows you to select the step of the package that will be used to start the deployment. The default is set to Step 1 for all targets. This can be set universally for all targets or it can be set for each individual target. NOTE: Available only when deploying a single package. Selects the Deploy User credentials from PDQ Deploy to be used during this deployment. IMPORTANT: Enterprise mode is required to use Pull. Selects how the Windows service "logs on" to the target computer after it is created and the how the package steps are executed. Deploy User is the recommended and most common setting. For more information about when and why to use other options, see Run Packages As in Deployments Preferences. IMPORTANT: Enterprise mode is required to use Deploy User (Interactive) or Logged on User. Sends an email report when the deployment finishes. IMPORTANT: Enterprise mode is required. Additionally, you must configure both the Mail Server settings in Preferences as well as designate at least one email recipient in the selected Post Deployment Notification before you can enable this option. Saves the list of targets to use the next time you start a deployment with this window. Determines if a ping or a Wake-on-LAN will be attempted prior to a deployment. For more information, see Offline Settings. NOTE: Wake-on-LAN requires Enterprise mode in both PDQ Deploy and PDQ Inventory. Uses the Offline Status settings from the package. Clear this checkbox to set custom offline status settings for the deployment. For more information, see Deployments. Determines if offline target computers will be placed in the Retry queue. For more information, see Retry Queue. IMPORTANT: Enterprise mode is required. Uses the Retry Queue settings from the package. Clear this checkbox to set custom retry settings for the deployment. For more information, see Deployments. 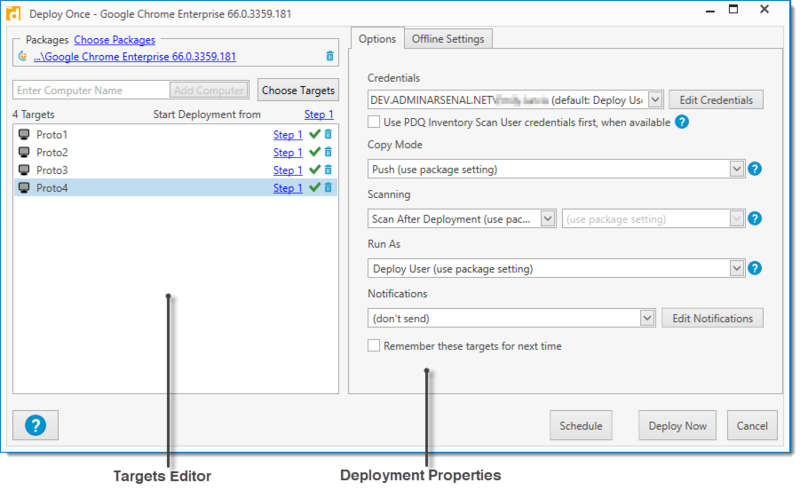 For more about Deploy Once deployments, see Deploying Package(s) with Deploy Once and Deployment Settings.